The 2018 edition of NFPA 99: Health Care Facilities Code makes performance criteria more usable, enforceable, and adoptable. A must-have resource for everyone involved in health care safety, NFPA 99: Health Care Facilities Code provides performance criteria for health care facilities that follow a risk-based approach, where it is the risk posed to patients and staff, not the type of building, that defines safety guidelines. Provisions govern installation, inspection, testing, maintenance, performance, and safe practices for facilities, material, equipment, and appliances -- including medical gas and vacuum systems. Requirements addressing the risk assessment in Chapter 4 have been revised to clarify the responsibility for conducting a risk assessment and determining risk categories. Chapter 5 includes requirements that now allow for the use of oxygen concentrators as central supply sources for piped medical gas systems. Corrugated medical tubing is now a permitted material for medical gas and vacuum systems. Chapter 6 is completely reorganized to group related requirements, allowing for the deletion of duplicated requirements for different types of EES. Chapter 7 now includes requirements for wireless phone and paging integration as well as for clinical information systems. Chapter 14 compiles all of the requirements for inspection, testing, and maintenance for hyperbaric facilities into one section. A new Chapter 15, Dental Gas and Vacuum Piping Systems is dedicated to the application of piped gas and vacuum systems for these systems that do not always readily fall under the requirements for medical gas and vacuum as addressed in Chapter 5. Requirements for fire extinguisher selection are included in Chapter 16 for spaces unique to health care facilities. Keep health care facilities up-to-code and patients and staff safe. 5.1 Category 1 Piped Gas and Vacuum Systems. 5.2 Category 2 Piped Gas and Vacuum Systems. 5.3 Category 3 Piped Gas and Vacuum Systems. 6.6 Category 3 and 4 Spaces. Chapter 9 Heating, Ventilation, and Air Conditioning (HVAC). 10.2 Performance Criteria and Testing for Patient Care–Related Electrical Appliances and Equipment. 10.3 Testing Requirements — Patient Care–Related Electrical Appliances and Equipment. 10.4 Nonpatient Electrical Appliances and Equipment. 11.2 Cylinder and Container Source. 11.3 Cylinder and Container Storage Requirements. 11.4 Performance Criteria and Testing. 11.6 Operation and Management of Cylinders. 12.5 Emergency Management Category 1 and Emergency Management Category 2 Requirements. 13.3 Security Vulnerability Assessment (SVA). 13.6 Access and Egress Security Measures. 15.2 Nature of Hazards of Gas and Vacuum Systems. 15.3 Category 1 Dental Gas and Vacuum Systems. 15.4 Category 2 Dental Gas and Vacuum Systems. 15.5 Category 3 Dental Gas and Vacuum Systems. 16.3 Special Hazard Protection for Flammable Liquids and Gases. 16.6 Waste Chutes, Incinerators, and Linen Chutes. 16.7 Fire Detection, Alarm, and Communications Systems. 16.8 Automatic Sprinklers and Other Extinguishing Equipment. 16.13 Fire Loss Prevention in Operating Rooms. 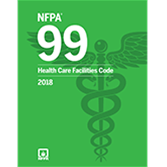 Building on its successful risk-based approach, the 2015 edition of NFPA 99: Health Care Facilities Code improves usability for better health care safety. The 2015 edition NFPA 99: Health Care Facilities Code provides performance criteria for health care facilities that builds on the risk-based approach introduced in the 2012 NFPA 99, where it is the risk posed to patients and staff, not the type of building, that defines safety guidelines. Provisions govern installation, inspection, testing, maintenance, performance, and safe practices for facilities, material, equipment, and appliances -- including medical gas and vacuum systems formerly found in NFPA 99C*. Requirements correlate with the 2014 NFPA 70®: National Electrical Code®. New provisions address using fuel cell systems for backup power, allowing the use of new technology while ensuring the same minimum level of safety. Type 3 Essential Electrical System requirements have been removed from NFPA 99 -- deferring to other codes for required egress lighting. Updated requirements for nurse call systems incorporate widely used terminology and align with the Facility Guidelines Institute (FGI). Other revisions respond to new information and the evolving industry. Revised minimum allowable temperature for cylinders for nitrous oxide and carbon dioxide help avoid potential loss of pressure. Rewritten Category 3 Medical Gas and Vacuum Systems provisions are aligned with the requirements for Category 1 and 2 Systems, with requirements specific to dental drive gas and dental vacuum systems. First-time requirements for oxygen-concentrator-based refilling systems reflect their increasing use in today's health care setting. Apply NFPA 99 to protect patients, staff, and visitors from the hazards of fire, explosion, and electricity in health care facilities. Work confidently to provide safer health care facilities for all occupants. NFPA 99: Health Care Facilities Code responds to the challenges of an evolving health care system with comprehensive requirements for the installation, inspection, testing, maintenance, performance, and safe practices for facilities, material, equipment, and appliances -- including medical gas and vacuum systems formerly found in NFPA 99C*. It's a critical resource for engineers, facility managers, Authorities Having Jurisdiction (AHJs), plumbers, gas and vacuum system installers, designers, and verifiers, security personnel, insurance companies, and manufacturers. The 2012 edition of NFPA 99: Health Care Facilities Code* reflects a new environment where it is the risk that a procedure poses to patients and staff, not the location where it is conducted, that defines safety guidelines. This groundbreaking edition has a new title -- Health Care Facilities Code -- and is rewritten to make performance criteria for health care facilities more enforceable and adoptable. In addition to the risk-based framework, this edition includes an updated Chapter 5, Gas and Vacuum Systems, including important changes to maintenance requirements necessary for safety. New chapters on security, fire protection, and information technology address industry needs. In another major change, operating rooms are considered a wet location unless a risk assessment of the area determines otherwise. The 2005 edition of NFPA 99: Standard for Health Care Facilities features changes to the emergency management chapter to correlate with NFPA 1600®: Disaster/Emergency Management and Business Continuity Programs. Extracted text from NFPA 110: Emergency and Standby Power Systems presents specific guidance in the chapter on electrical systems. Essential for plumbers, two new pipe joining methods in the chapter on gas and vacuum systems reduce the possibility of leaks and eliminate a potential fire danger or loss of system use. To improve safety, this edition also introduces additional restrictions on types of fabric, clothing, and materials that can be used in hyperbaric chambers. *Looking for NFPA 99C: Gas and Vacuum Systems? - Former NFPA 99C content can be found in Chapters 1-5 of NFPA 99. - Access all of the former NFPA 99C medical gas and vacuum systems content in Chapters 1-5 of the NFPA 99 Handbook. NFPA®'s Medical Gas and Vacuum Systems Installation Handbook combines requirements for Category 1-3 systems with expert insights, examples, and visuals that help you understand and apply them correctly. Interested in other editions of NFPA 99? Use the drop down menu above to select the edition year you need.